Situated on the banks of the River Thames in the iconic Sea Containers Building, Mondrian London brings a bold new energy to the South Bank. 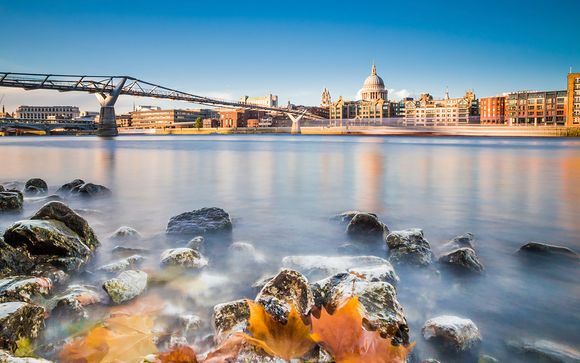 Sat between the Oxo Tower and Blackfriars bridge, located on the cultural mile with attractions such as Tate Modern and Shakespeare's Globe closeby. Spend an evening in the exclusive atmosphere of the rooftop bar, with its unique glass box structure and dramatic panoramic views over London. Culturally, London is breathtaking, with its galleries and museums among some of the most prestigious and comprehensive on earth. From the world-famous Shakespearean performances of the Globe Theatre to the cutting-edge artists pushing boundaries inside the Tate Modern, a staggering number of London's cultural attractions are within easy reach of the hotel. Seductive and striking, Mondrian London blends the style and sophistication of the boutique brand with South Bank's eclectic vibe. Created by renowned British designer Tom Dixon, the hotel captures the essence of the original Sea Containers building, exuding 1920s cruise ship glamour integrated with modern twists and sophisticated design. A new London destination, this hotel features a rooftop bar, cinema, riverside restaurant, spa and panoramic views. The hotel is ideally placed near world-class cultural institutions such as Tate Modern, The Globe Theatre, The National Theatre, as well as tourist favourites such as Borough Market and the London Eye. Just for you: guaranteed upgrade to a Superior Room. All Superior Rooms feature queen or king beds, custom designed dimmable lighting, bespoke furniture and stunning marble bathrooms indicative of Hollywood Glamour, complete with MALIN+GOETZ amenities. Some Superior rooms also boast city views or are slightly larger than Standard guestrooms. Unique design items include a drip wall painting handcrafted by Tom Dixon as well as his signature wingback chair. 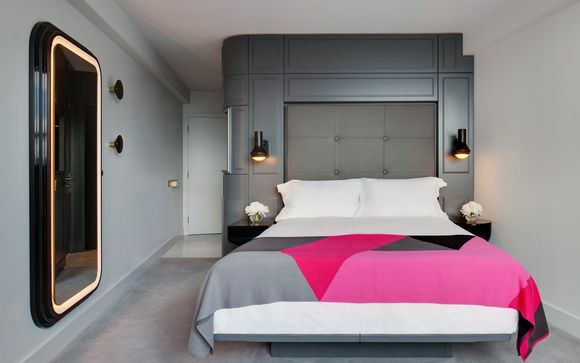 This offer is based on a bed and breakfast stay - full buffet breakfast in Sea Containers. Inspired by the golden age of transatlantic travel and the bounty of local fresh produce, Sea Containers combines the best of England and America, creating a restaurant that is refined in its offering, yet youthful and casual in its experience. Part gathering place, part decompression zone, the Den is where you begin your journey into the heart of London. It is Mondrian London's hangout parlour, offering wine, champagne and light snacks throughout the day. Dandelyan transports its guests to a place where they can lose themselves in exotic flavours, magnetic conversation and unexpected combinations. It boasts an iconic green marble bar and dramatic views of the Thames. It serves both innovative cocktails and refined interpretations of the classics, taking its inspiration from the botanical wilds of the British countryside and around the world. Rumpus Room is the rooftop bar & lounge inspired by a time when a party was more than a party, it was a lifestyle, an experience, a flash in time, that was gone before you knew it happened. With dramatic views of London, Rumpus Room comes alive as the sun goes down; a magical glittering glass box perched atop Mondrian. As expected, they specialise in bubbly, serving an extensive list of the world's best champagne offerings, or in specialty cocktails. This boutique bathhouse provides authentic spa experiences and personalised treatments, enabling you to discover moments of uninterrupted bliss. Explore the diverse range of therapies in an eclectic and comforting setting with an original selection of skincare products, leaving you feeling uplifted and refreshed. The gym features state-of-the-art equipment with a range of resistance equipment, free weights, rubber dumbbells and core strengthening accessories - so you can easily achieve your fitness goals. It is open 24 hours a day, and personal trainer sessions are available on request. The hotel cinema offers the best selection of new releases, classic matinees and family favourites in a luxury 56-seat cinema. It is open from Friday evenings through to Sunday, and is complete with state-of-the-art projection and sound. Flights: Flights are not included in this offer.